Today, Korea is an industrial nation standing tall on the world stage. Its semiconductor, automobile, shipbuilding, steel making, and IT industries are on the leading edge in global markets. It hosted the 1988 Seoul Olympics and the 2002 FIFA World Cup Korea/Japan. More recently, Korean dramas, movies, and music are attracting many audiences in Asian countries and beyond, creating what is being called the “Korean Wave.” Korea’s new standing in the international community was highlighted in 2010 with the nation becoming the first Asian country to chair the G20 and host the G20 Seoul Summit. A 2005 census showed one half of the population practice religion. Among them, 10,726,463 Buddhists, 8,616,438 Protestants, and 5,146,147 Catholics comprise the three dominant religions. All Koreans speak and write the same language, which has been a decisive factor in forging their strong national identity. The words and accent spoken by the people of the Seoul area are regarded as standard. Among regional dialects, that of the people of Jejudo Island off the South Coast is most distinct. Hangeul, which consists of ten vowels and 14 consonants, can be combined to form numerous, syllabic groupings. It is simple yet systematic and comprehensive, and is considered one of the most scientific writing systems in the world. Hangeul is easy to learn and write, which has greatly contributed to Korea’s high literacy rate and advanced publication industry. Thanks to Hangeul, Korea has achieved a nearly 100% literacy rate. The scientific and easy-to-write alphabet has also given the country an edge in the computer age. 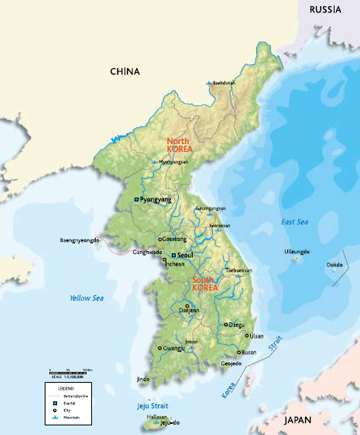 The Republic of Korea lies between 38ºN and 33ºN latitude and 126ºE to 132ºE longitude. The country has a continental climate of very cold, dry winters and very hot, humid summers. Winters are influenced by westerly winds from Siberia and the Mongolian plateau, while summers are generally characterized by an oceanic climate due to moist, warm winds from the Pacific Ocean. Korea has four distinct seasons, though spring and autumn tend to be short. Spring comes in early April and lasts throughout May. The hot and humid summer begins in June and lasts about four months. The summer rainy season lasts from the end of June to mid July. Summer ends in late September, giving way to crisp, clear autumn days that last until the end of October. It becomes colder in November, and a very cold, bleak winter sets in during December and lasts until the end of February. South Korea faces Japan across the East Sea and China across the Yellow Sea. To the north, across the DMZ, is North Korea. The Taebaek Range, referred to as the backbone of the Korean Peninsula, stretches along the east coast and slopes steeply into the East Sea. Along the western and southern coasts, the mountains descend gradually onto the coastal plains, and large rivers wind through the area. The relatively wide plains stretch far from the mid-and downstream sections of the rivers. Many of Korea’s highest mountains are part of the Taebaek Range. The most famous and picturesque is Seoraksan Mountain. The Taebaek Range has a branch trending southwest and culminating at the Jirisan Mountain massif. This is the Sobaek Range. The highest mountain in the Republic of Korea is Mt. Hallasan, a dormant volcano at the center of Jejudo Island. The largest rivers in South Korea are the Hangang River, Geumgang River, Yeongsangang River, Seomjingang River, and Nakdonggang River. The annual precipitation of Korea is 1,245mm, which is 1.4 times the global average, but the per capita precipitation is only one-eighth of the world average. Water management in Korea is difficult, especially because more than 60% of annual precipitation is lost as runoff during floods and torrential rains, while rivers dry up in the dry season. Exacerbating matters, water consumption has been increasing sharply due to population growth, economic development, and changes in lifestyle. Korea is a peninsula. The Yellow Sea is to the west, the East Sea to the east and the South Sea to the south. To the south of Korea’s largest island is the East China Sea. The west and south coasts have heavily indented ria coastlines where the tidal range is enormous, and the relative flatness of land means that the tideland is very wide. Dotted with so many islands, it is called Dadohae, meaning ‘sea of many islands.’ The east coast, in contrast, is very straight, the water is deep, and the tidal range is narrow. Along the coast are sand dunes and lagoons, and the volcanic islands of Ulleungdo and Dokdo are far to the east on the East Sea.